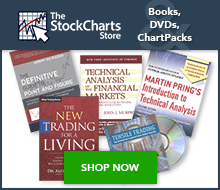 StockCharts provides data for a select group of economic indicators. Depending on the data series, these are updated on a weekly, monthly or quarterly basis. For example, chartists can plot weekly Initial Jobless Claims ($$UNEMPCIN) or monthly Non-farm Payrolls ($$EMPLOY). These can then be compared to the S&P 500 for analysis. Users can find symbols for economic indicators by searching for “$$” in the symbol catalog (without quotations). All economic symbols begin with the double Dollar sign ($$).